A holocaust survivor has labelled Donald Trump’s language “damaging” and urged the public to remember the “symptoms” of genocides of the past. Speaking at an event ahead of Holocaust Memorial Day on Saturday, Steven Frank also urged leaders to take action over the Rohingya refugee crisis in Burma. Mr Frank told the Press Association: “The world is in troubled times, if we don’t remember the past, nobody will know about the future and won’t recognise the symptoms and the whole thing will start over. “All this business about people turning their back on refugees in Europe is so incredibly short-sighted, they cannot remember the Jewish people who fled Nazi Germany and went on to give an enormous contribution to this country. Mr Frank, 83, was one of only 93 out of 15,000 children who survived the Theresienstadt concentration camp, while his father and two aunts were killed at Auschwitz, and he urged the public to take action. He said: “Perhaps we can make those who are in charge understand they should be thinking much more seriously about what is happening and the power of their words. 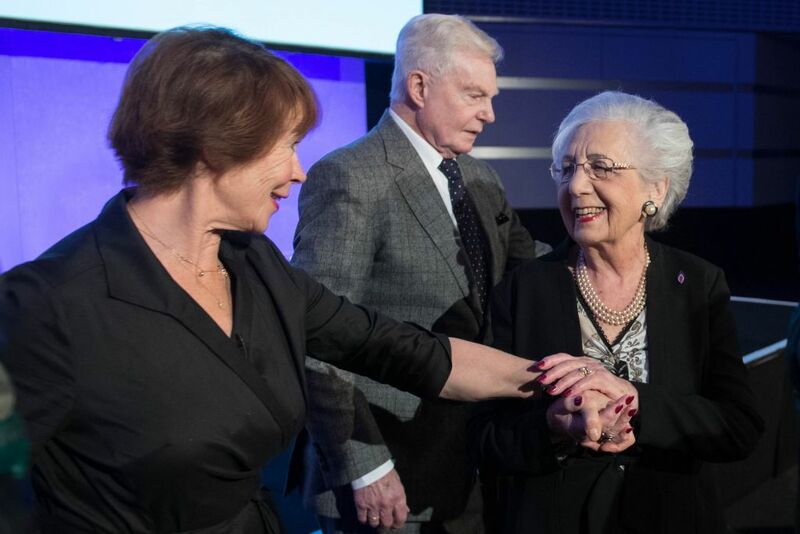 Celia Imrie (left) and Derek Jacobi (right) join Holocaust survivor Helen Aronson (centre) before a commemorative event at the QEII Conference Centre in London, to mark Holocaust Memorial Day. Mr Frank also called the election of Trump as US president a “tragedy” and warned against his use of language. “How can you have a message for Donald Trump? It’s like talking to a great, big rubber ball, it just bounces back again, ” he added. 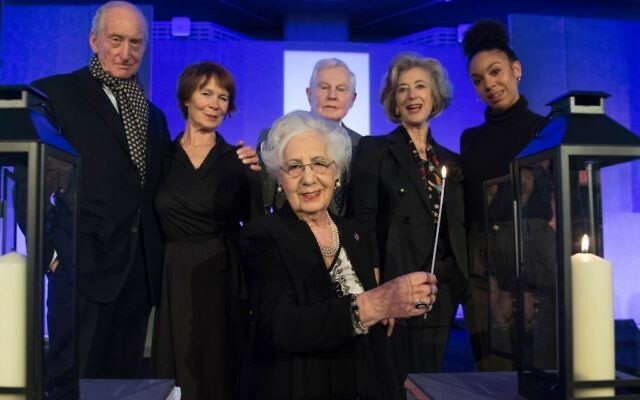 The commemorative event in London was in preparation for Holocaust Memorial Day on January 27, and was attended by politicians including Labour leader Jeremy Corbyn and Liberal Democrat leader Vince Cable. 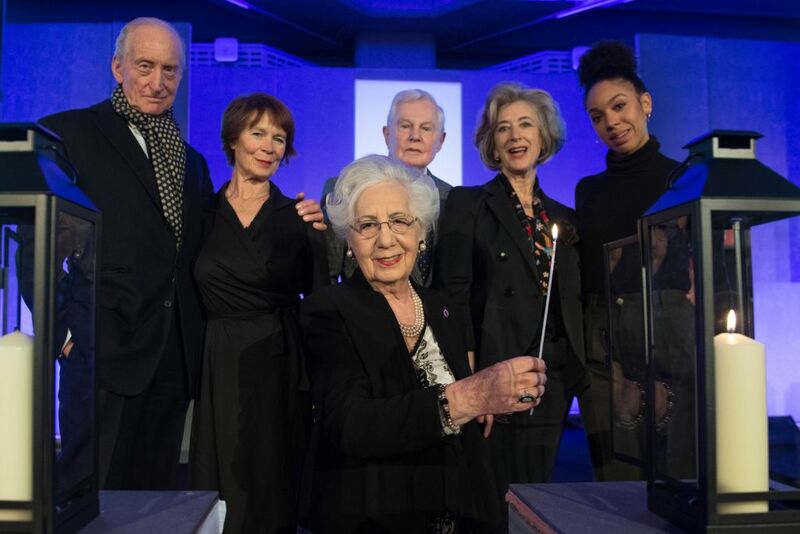 Celebrities including actors Sir Derek Jacobi and Charles Dance gave readings, while journalist Sameena Ali-Khan narrated the event. Olivia Marks-Woldman, the chief executive of the Holocaust Memorial Day Trust, said: “The repercussions of the holocaust haven’t gone away and the steps leading up to it have been seen in more recent genocides, which are also commemorated by this day. “Our theme this year is the power of words and, just as in Nazi Germany, we still see stereotyping today. “People are very aware of how easily social media has facilitated widespread abuse, misogyny and racism so it’s incumbent on us to challenge abusive tweets when we see them and be responsible for language we ourselves use.